Nowadays there're a varitey of brilliant software functioning exactly as you require, but the problem is that once a good piece comes out, everybody copys it. As a result, you're surrounded with identical products and trapped in deciding which one to trust. Considering the wide choices of FLV to WAV converters, here we complied a list of top 5 free converter out for your choice. Wondershare Free Video Converter is one of the most powerful and reputable video and audio conversion tools available for free. It really does offer a staggering list of features and performs roughly 10x faster than the majority of video conversion tools out there at the moment. Wondershare also has a wide array of excellent editing and burning features, making it one of the most complete conversion tools out there. Moreover, it supports 1000+ formats conversion, and you can download any video you like from the web with just a few clicks. Below lists its 3 major advantages for your reference. Extract audio files from different video formats like FLV and save them as MP3, WMA, M4A, WAV, APE, FLAC, AAC, AC3, MKA, OGG, AIFF, RA, RAM, MPA. This app looks just like the majority of your Windows tools, with a clean and easy to navigate UI making it one of the most popular conversion tools around. You get a lot of programs with a sticky interface, which makes them less popular, but Koyote provides both great usability and a wide array of solid features. Manipulate your video and audio into just about any format, quality rating, and size in just a few seconds. You can turn just about any file to play on any format or device. Matched with its great user interface, you have an excellent free video and audio converter here which can be utilized and mastered in just a few hours. Although most audio and video converters are software, Clip Converter is a simple web-based equivalent. Easy to use, capable of converting files directly from an online URL or by uploading the file, it's really a powerful tool. It even comes with a browser add-on for simplified use, and a desktop equivalent if you so choose! You can pick from a variety of different output formats for both audio and video, giving you extreme control over your video and how it will turn out. Its simple interface makes it a hit with just about anybody who was used it. Make sure you bookmark this page–it's a brilliant tool for quick, no-hassle conversions. DVDVideoSoft produces a huge variety of different media conversion software which you can download and use for free. With over 40 different converters, you have access to quick, powerful and safe media converters. They produce converters like YouTube to MP3 converters, YouTube downloads and a huge collection of miscellaneous audio and video conversion and editing tools. Re-size your image, improve video quality and even record screen activity, all through the different tools provided by DVDVideoSoft. Supporting over 200 input formats, you can do just about anything you feel the need to your videos. It offers a level of functionality you would struggle to find in many premium products, and can even convert online videos. All you need to do is to paste the URL straight into the software and turn your videos into the format you require in seconds. With support for mobile devices and even the ability to burn blu-ray videos, this tool has everything you can think of that makes your video conversion much easier. The five products listed here are some of the most recognized and easy to use video and audio conversion tools on the web today. They are all well worth trying out, as they actually outperform some of the expensive premium conversion tools out there on the market today. Give them a shot and see just how easy video and audio conversion has become! 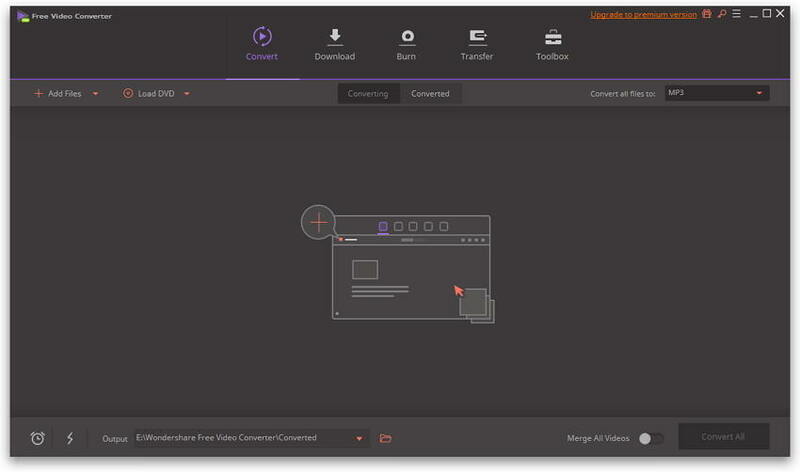 But you want to convert video to audio in different formats, you'd better use Wondershare Free Video Converter as it supports the most audio output formats. Download and use it now.